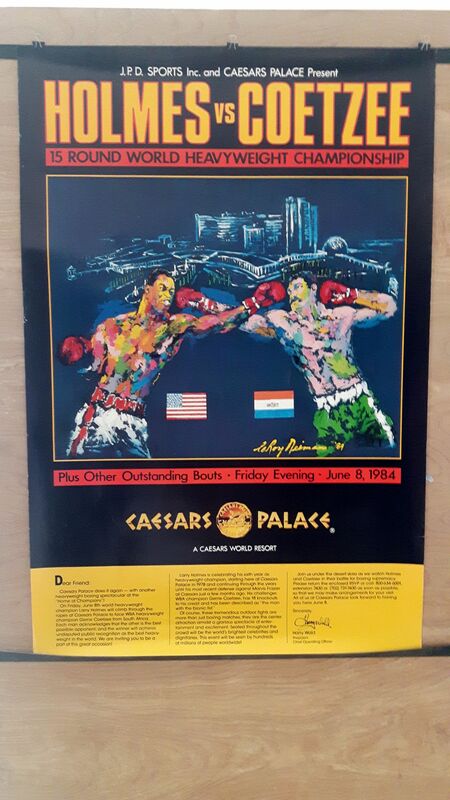 Description : Here we have the official Caesars Palace VIP invitee/high roller poster sent only to selected guests (Leroy Neiman art work) onsite poster for the WBC/WBA world heavyweight title unification mega-fight between WBC champion Holmes & South African WBA world heavyweight title holder Gerrie Coetzee. 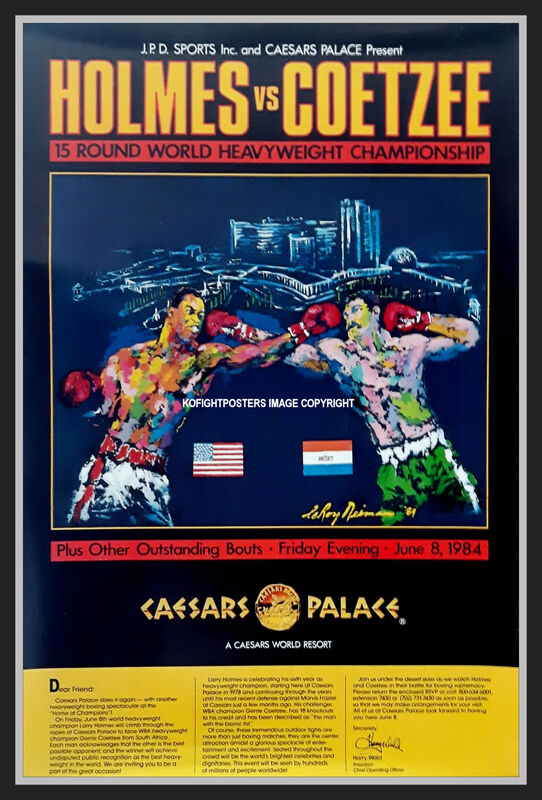 Holmes signed to fight Gerrie Coetzee, the WBA Champion, on 8th June 1984 at Caesars Palace. 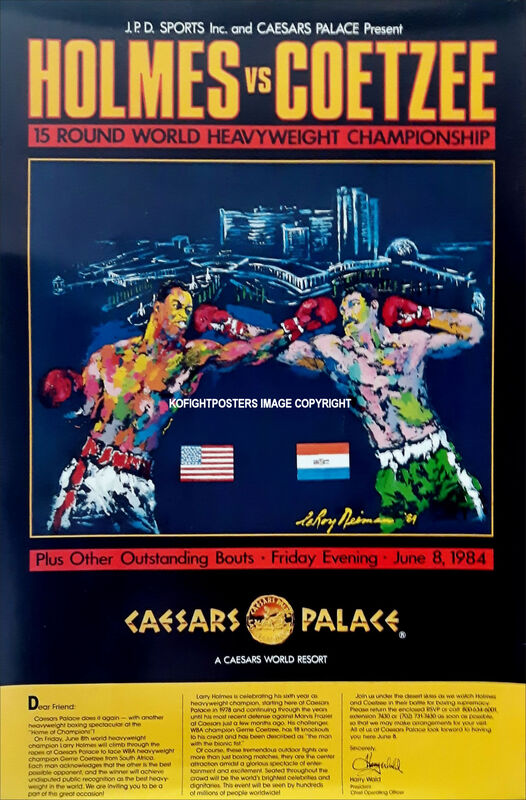 The fight was being promoted by JPD Inc., but it was canceled when Caesars Palace said the promoters failed to meet the financial conditions of the contract. Holmes was promised $13 million and Coetzee was promised $8 million. Even after cutting the purses dramatically, they still couldn't come up with enough financial backing to stage the fight. Don King then planned to promote the fight, but Holmes lost a lawsuit filed by Virginia attorney Richard Hirschfeld, who said he had a contract with Holmes that gave him right of first refusal on a Holmes-Coetzee bout which all but made the proposed bout dead in the water. Holmes relinquished his long held WBC belt & became the inaugural International Boxing Federation (IBF) Heavyweight Champion. Condition : Good / minor handling*surface compression*edgewear*framed for display purposes only.